If you’ve followed any sort of food issues recently, you are familiar with his name. The Omnivore’s Dilemma by Michael Pollan – quite possibly the seminal book beginning the recent cultural critique of industrial farming – heavily features him and his farm, Polyface in Swoope, Virginia. Since the publishing of Dilemma he has also featured prominently in several food and farming themed documentaries, including Food, Inc and Fresh. But that’s not all. Magazine articles, international newspapers, speaking engagements, books, blogs, radio interviews – he’s ubiquitous. Here in the Shenandoah Valley of Virginia he’s practically a celebrity. In fact, in 2009 he was Charlottesville’s Person of the Year. Personally, we’re a little sick of him. 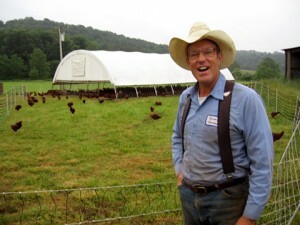 Not that Joel Salatin isn’t a visionary and an inspiration to many, he is. In fact, we all visited his farm before deciding to do this project this year (a visit which at the time was free, and now costs $65 a head). We’re also buying our meat from his farm. Mainly, we’re annoyed that the media can’t seem to find any other people to interview. We’re hungry to hear from other farming voices. Occasionally you’ll see an interview with Will Allen of Growing Power in Milwaukee, but other than that – nada. Think about it. You, our reader, average urban-dweller with little farming experience, name one other farmer you know by name. Just one (we don’t count). Our one critique of Salatin is that it’s unclear how reproducible his methods are. As we showed with various graphs back in February, Polyface meat is much more expensive than other vendors, 2.5 times more than your generic grocery store. One could argue that the product is worth more because the quality is higher, and that would be true. One could also argue that food is too cheap now a days and that if we value good food we should put our money where our mouth is, which is also a valid point. However, Joel Salatin’s celebrity also allows him to charge more for his meat and people are willing to pay it. It’s basic supply and demand. If someone were to use his exact methods of farming (which is entirely possible given that he has published books on exactly how to do so, however, we have never met a farmer who has) they wouldn’t be able to sell at Salatin’s celebrity prices. The new American fascination with where our food comes from should be prompting people to get out and meet their own farmers, not read about some guy here in Virginia. Frankly, I think Joel Salatin would agree with us on that point. Go to your grocery store and ask where the pork chops or peaches are from – ask if you can visit that farm. Make sure you’re buying from local, family owned farms and not giant mega-industrial farms. Or better yet, go to the farmer’s market and meet the farmer yourself. Little known fact, when farmers sell their produce to grocery stores, grocery stores automatically double the price. So although you might be buying something at the same price at a farmer’s market, the money you’re spending goes directly to the farmer and not to some corporate office in Austin, Texas. Make your own farmers celebrities. Heck, they grew your food. You literally wouldn’t be able to survive without them. Right now you may not even know their names, but don’t they deserve as much credit as Mr. Salatin? The farmer’s market is truly the direct link and we should support them all. And how can one person be so famous for doing what the average farmer does without the media? Next time we go to the farmer’s market we should ask their names and post them here. Let us start a wall of farmers…. There are a bunch of similar farms in the bay area. One that comes to mind is Marin Sun Farms (which is utilized by several restaurants in the area, including Alice Water’s Chez Panisse) and have a butcher shop at a market hall in Oakland. I haven’t adventured to buy their meat yet, but I’m pretty sure it’s just as pricey as Polyface meat. But all this attn to Salatin, certainly makes me wonder why the media isn’t going to these other farms, and why Salatin is jumping on his media frenzy. I mean, I understand why I would do it, but I thought he wanted to educate people so we can all be better, not charge people 65 a head. We just heard about your project and are very intrigued by it! Your project and blog are among many things pushing us towards healthier eating habits, not just for ourselves, but for the environment as well. We would love a list of resources you’ve used in planning and executing this project! I heard about your project when Jen did, but I’m only now getting a chance to read about what you’re doing. Good for the four of you for living the communal and close to the earth dream. I second Jen’s request for a bibliography of sorts–your project really is intriguing.